Click on the image to go to the Live Stream. The event starts at 7pm ET. This evening, Samsung is launching their latest phone in the Galaxy S series. The new model is logically called S4, and is expected to have full HD resolution (1920×1080) on a 5-inch (or 4.99-inch) screen, as well as a 13MP camera. It is still unclear what processor will power the new phone, but some rumors say a quad-core for the North American market and an eight-core for the international models. The event takes place in New York tonight at 7pm Eastern time, and there will of course be a live stream. It can be viewed here. 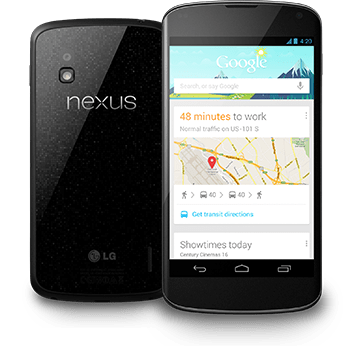 I am not sure if I am misunderstanding something, but the new Nexus 4 seems to be sold unlocked for $299 (8 GB model) and $349 (16 GB model) when Google start selling it next week. The phone is built by LG, has a 4.7 inch screen with 128 x 768 resolution and a Dualcore Snapdragon S4 Pro processor. The radio part support GSM/HSPA+/EDGE/GPRS on all the major frequencies, so it shold work both in the USA and on the international market. The battery has a 2100 mAh capacity, the phone weighs 139 gram and contains a 8MP camera, GPS and all the other sensors we expect today, and it is runing Android 4.2 (Jelly Bean). Yes, not the 4.1 flavor of Jelly Bean, but the latest version. The specifications are just below the ones for Samsung Galaxy SIII, and most notable is that (like the other Nexus products) it does not offer memory expansion through SD cards. It also lack LTE support.